Tram deliver subtle, dreamy pop music. The three-piece from London, fronted by singer/songwriter Paul Anderson deliver a debut that is mellow and toned down, making sure everything they play can be felt. The songs aren't that lively or action packed, but what Tram does with silence and the ability to break silence with the smallest of sounds is what will shine the band's light on you. Soothing and relaxing, the songs swim by without even a glance, though they leave a lasting impact with the least amount of resistance. 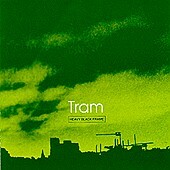 HEAVY BLACK FRAME is a warm, friendly, inviting album that can be played during various moods: Happy, sad, depressed, or tired. The quiet pop and easy-going gentleness of the band may not strike you at first, but give it a few, and you'll understand what Tram is all about. I'll give it a B.